A replacement for a ferry that operates across a stretch of water in Cornwall is to be built in the county. 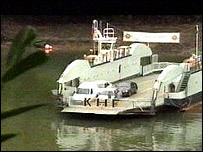 The King Harry Ferry at Feock takes 23 cars and their passengers on a 450yd (412m) trip across the River Fal. Letters of intent have been exchanged between the ferry company and Pendennis Shipyard in Falmouth. It will be the seventh ferry to serve the historic crossing, recently voted one of the 10 most beautiful crossings in the world. The letters of intent will be followed within a few days by formal contracts to build the 400-ton ferry which operates between the village of Feock and Philleigh on the Roseland Peninsula. Plans were announced to renew the ferry in December. The new vessel will be mostly of a steel construction and 8m longer and 2m wider than the present ferry. The increased size will enable it to carry 34 cars rather than the present 28. The first steam ferry service across the Fal from Feock to Philleigh on the Roseland peninsula started in 1888. The current ferry has been in service from 1974 and carries 300,000 cars and one million people last year. In a report compiled by independent travel writer Ryan Levitt, the ferry was described as among the most picturesque in the world because of its view of the river, rivalling Lake Titicaca in Bolivia and the Grand Canal in Venice.